An exhibition and demonstration of traditional building skills is being held in Cornwall this weekend. Called Down to Earth, the event at Porthtowan, aims to encourage more builders to use old-fashioned materials for renovations and new-build projects. Skills being demonstrated at the Mount Pleasant Eco Park include cob walling, lime rendering and scantle slating. Cornwall Sustainable Building Trust says there is strong demand in the duchy for traditional building skills. 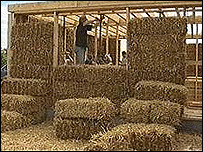 Materials used in traditional building techniques are often more sustainable because they are sourced locally and so use less energy to transport. Many can also be recycled nearby like the subsoil and stone used in cob walls. One of the exhibitors will be the Falmouth-based firm Geoscience, which installs ground source heating systems which use the natural warmth from the earth. Cornwall Sustainable Building Trust says there is a shortage of qualified people and it is currently running courses using Objective One money to boost skills.